Home Security – Wirelessly allowing friends and family to enter your home with automated door locks, viewing live video through surveillance cameras, and setting up customized alerts on your phone are just a few ways that you can automate your home security while protecting your family. Money Savings – With home automation, you can control the lighting and heating systems when you’re not using them. Many families with home automation have reduced their bills by almost 20%. You also may be eligible for home insurance discounts. Convenience –Imagine pressing one button for full home automation: your smartcode deadbolt locks your door, your security system arms itself, all your lights turn off, and your thermostat sets itself at a pre-determined temperature. Home Safety – Avoid walking throughout the house in darkness, possibly causing an injury. The features provided with home automation can automatically light closets, stairways, and other dark areas upon entry. You can always make sure that you turned the oven off, or that your daughter didn’t leave her flat iron on before school. Environmental Benefits– Home automation allows the common household to have a better grasp on their environmental impact. It can help reduce power consumption and automatically turn off devices when they are not in use. Peace of Mind– The home automation system allows you to check on all of the little things you may have forgotten. When you’re on vacation, you can control the lighting to make it seem as if someone is home. Automating your home provides improved security, peace of mind, and even cost savings over time. With state of the art technology and improved convenience, you can even make an impact on the environment.Home automation security systems innovate your home and allow you to manage it with ease. Your home security and safety is our priority. Beyond taking precautions to prevent a home fire, we at AMSA recommended that you know how to approach a blaze, should it occur in your Atlanta area home. It’s important to remember that there are several different types of home fires, and they need to be controlled in different ways. Class A: This is considered an “ordinary fire.” Any fire that leaves an ash including wood, paper, or trash is a Class A fire. Also included in this category is clothing, rubber, and plastics. The best way to battle this fire is with water. Class B: These fires are created from flammable or combustible liquids. Oil, gasoline, spray cans, hairspray, paint thinner, kitchen oils, propane, and acetylene are all included in class B. The best way to battle this fire is to smother it in order to deplete the oxygen supply with a fire extinguisher. It is important to remember that water will not put out this type of fire. Class C: These fires are created from energized electrical fires. This can be started from any electrical wiring in the household. 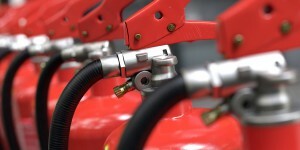 To handle this type of fire, de-energize the circuit immediately and use a fire extinguisher labelled ABC or BC. Class D: These fires are created from combustible metal fires. Magnesium and Titanium are the most common types of metal fires. If metal ignites DO NOT use water in an attempt to put it out. These fires are best extinguished with a dry powder agent in a fire extinguisher labelled D. These work by smothering and heat absorption. Class K: These fires are general kitchen fires created with cooking oils, grease, or animal fat. The best agent to extinguish these fires is Purple K, which is the typical agent found in restaurant kitchens. For a fire at home, you can use a fire extinguisher labelled ABC or BC. It is important to remember that water will only fuel this fire. To operate a fire extinguisher, remember the word PASS. Remember, when using a fire extinguisher, always point it at the base of the fire, not the flames. On average, fire departments respond to 357,000 home fires per year. Major causes of home fires include cooking, unintentional carelessness, open flames, appliances, and smoking. Don’t forget to change the batteries in your smoke alarms twice a year. Monitored smoke and carbon monoxide detectors are strongly recommended for their always-on safety coverage and emergency response notification, in addition to being a standard auditory alarm. Stay educated in fire safety to protect your home and family.